Pollination Wunder Station an amplified habitat installation for wild, solitary nesting bees and wasps (2011 at The Tree Museum). 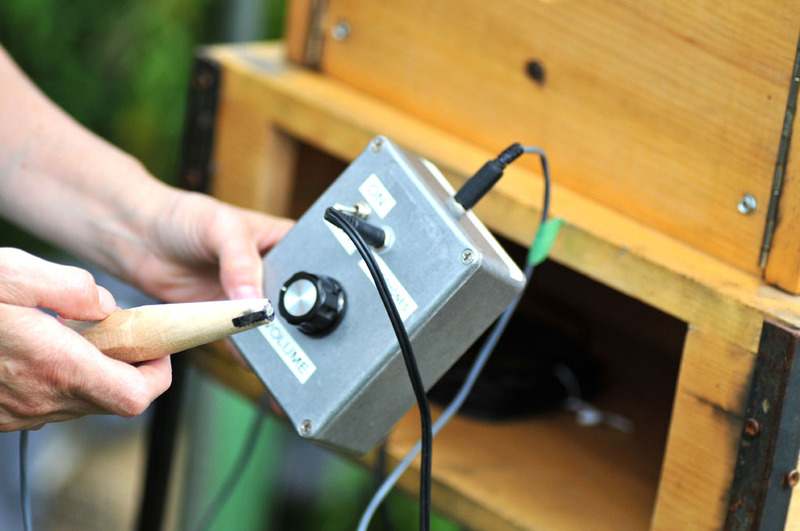 Audio Bee Booths and Cabinets foster the art and science of observing solitary native bees and their role in pollination ecology. Aesthetically compelling, immersive and informative, these outdoor works intersect habitat interpretation, bio-art, sound installation and sculpture. 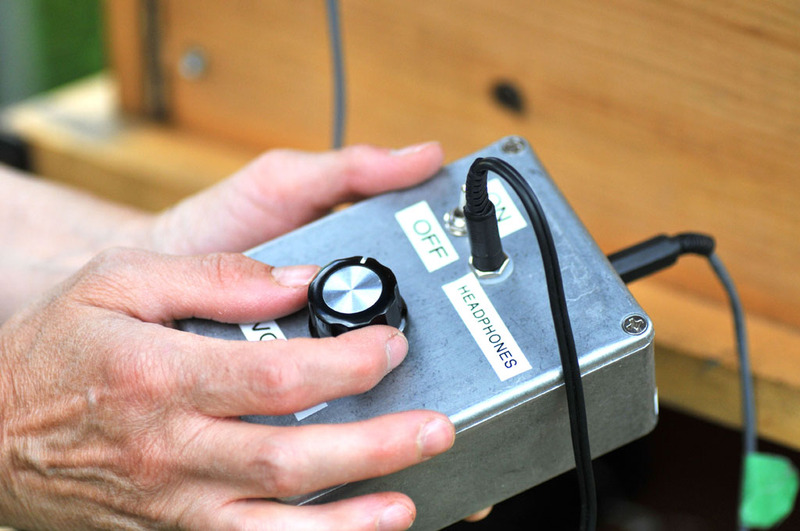 They allow the public to safely view and listen to solitary-dwelling, (mostly) native bees — pollinators which are quite different than European honey bees — and solitary wasps, nature’s insect controllers. 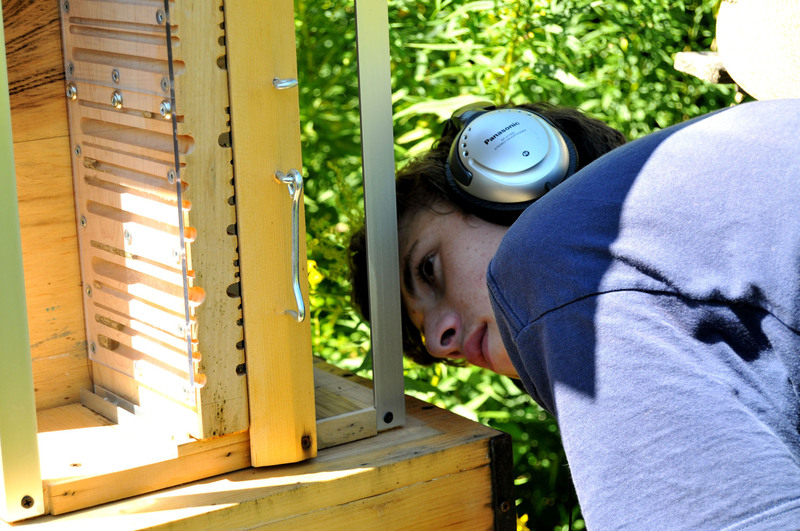 The cabinets present the nuances of solitary, wild bees and wasps and their activities within their tunnel nests; pairing magnified views in tandem with amplified sound, these installations facilitate an enhanced perception of their tiny inhabitants: solitaries and other nest biota in action, up close. In effect, the viewer extends her own senses and enters a micro world which normally takes place in the dark – safely spying on the solitaries’ nesting activities, life cycles, parasites, and their dynamic relationships with the surrounding habitat. Above: By Sarah Peebles. Assisted by Rob Cruickshank, electronics; John Kuisma, woodworking; Chris Bennett, pyrography. At The Tree Museum, Gravenhurst, ON, Canada, 2011 (photo: Sarah Peebles). Above: Prototype sensory booth at The Stop Community Food Centre in Wychwood Barns, Toronto (2014) with staff Kanaka Kulendran and volunteer Idris Mayem from The Stop. Initial prototype at The Toronto Zoo Education Branch (2010). Prototype Booth Pyrography images here (2011). Current location: Toronto’s High Park Nature Centre, Toronto along with “Sonic Solitaries”, a new addition to HPNC (more at Audio Bee Cabinets & Habitat Walls ). More photos of the prototype booth at The Stop in 2012 here. 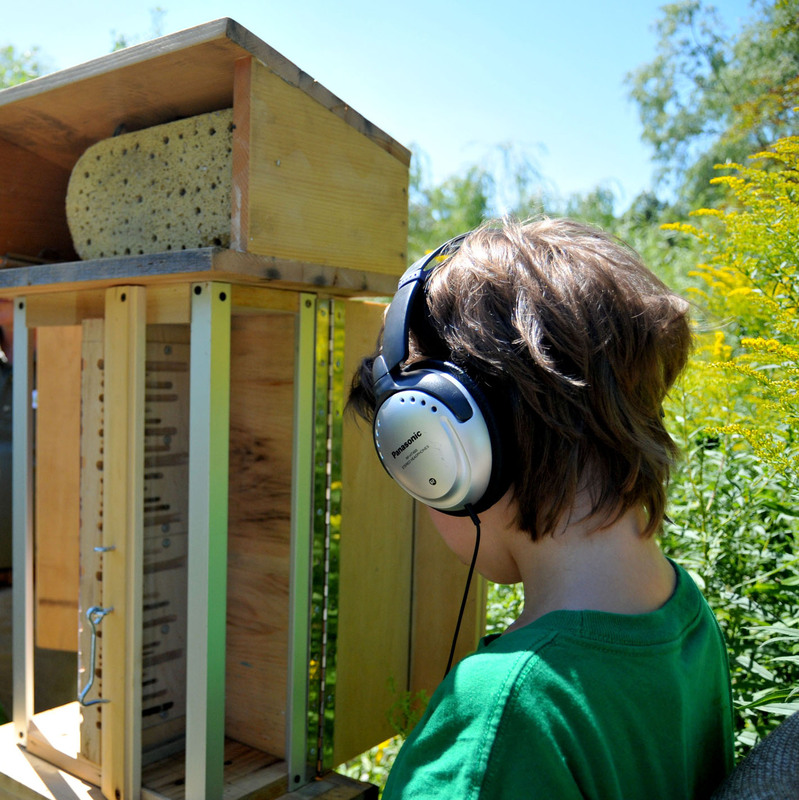 The Audio Bee Booth is an amplified nesting cabinet which provides habitat for wild solitary native bees and wasps (which are not social insects such as honey bees or bumble bees) while providing an accessible window to the public to enhance our understanding and appreciation of our local pollination ecology. A wide variety of wild solitaries throughout the world nest in vacated beetle bores and hollow stems, such as raspberry bramble, and are essential pollinators (bees) and insect controllers (wasps). Some 30 percent of the world’s bee species are wood and twig nesters, while roughly 70 percent create tunnel nests in the ground; most are solitary. The booth is a permanent installation which attracts local solitaries and their associated nest biota, and which aggregate passively over the course of several years between the Spring and Fall months (in temperate regions). The booth’s nest planks passively gather inhabitants; they are not not pre-stocked. 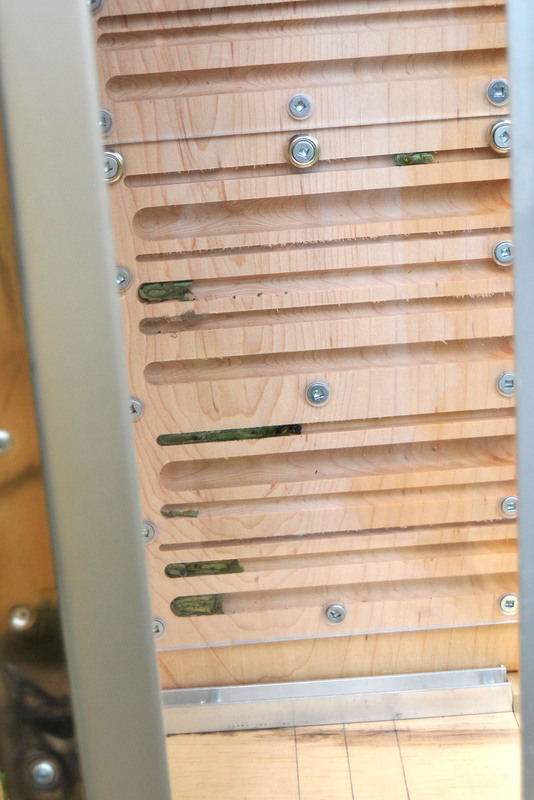 Wood nest-planks are routed on both sides with grooves of various widths (and various shapes), covered with plexiglass, and embedded with a vibrational sensor. Planks can be viewed from one or both sides and are removable to allow for swapping out with a clean plank for pathogen control. 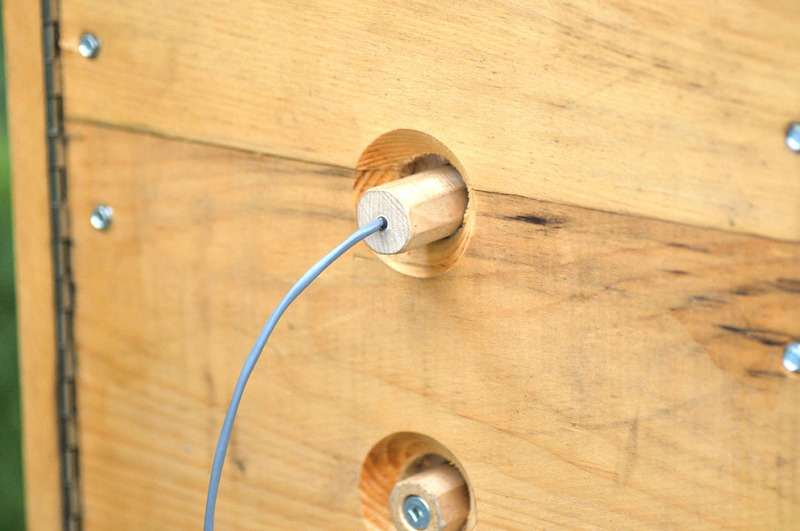 Vibrational sensors embedded within nest-planks act as microphones and are internally connected to custom electronics, a solar panel and battery. 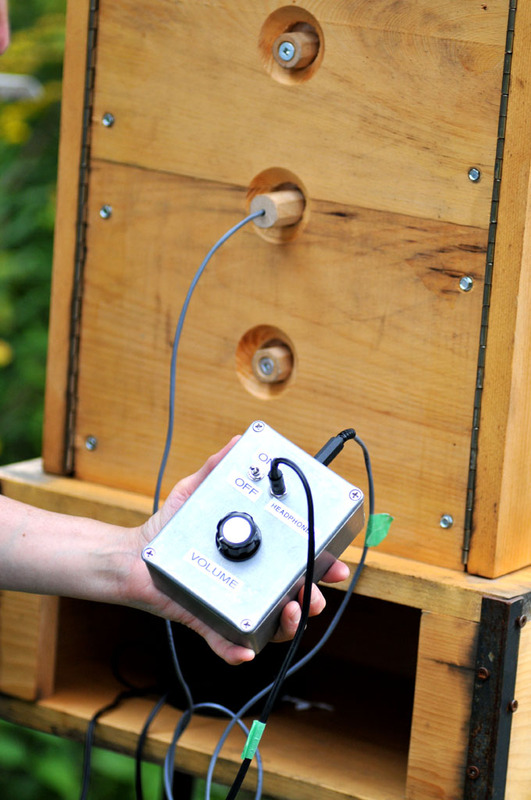 Visitors access the micro-sound of inhabitants with headphones or earbuds via headphone jacks and a weather-resistant audio interface (some cabinets interface with a hand-held battery-powered amplifier). 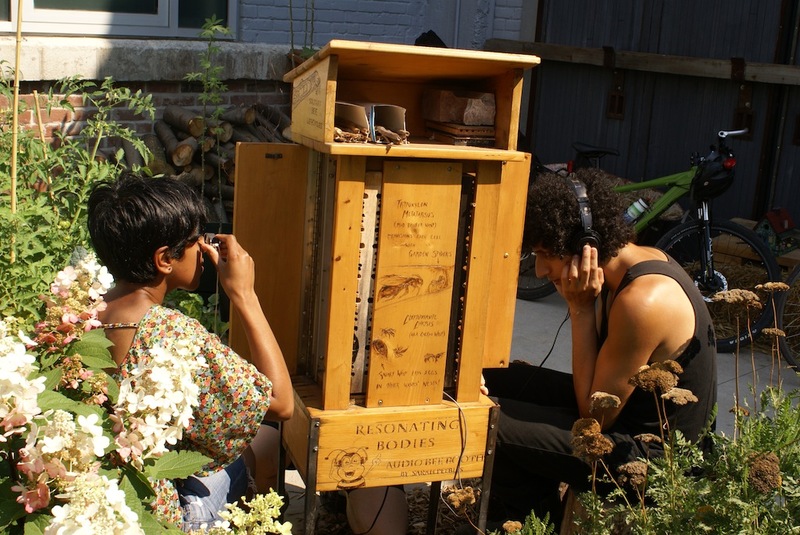 Combined with reading glasses, loupe or magnifying lens, the booth provides an immersive environment in which to observe these pollinators in all stages of their life cycles. Cabinet exteriours are either plain or adorned with custom wood-burned & painted illustrations featuring specific native bees and wasps, native flowers frequented by them, and aspects of their nesting biology. Concept, research and production by Sarah Peebles. Prototype amplified nest-plank fabricated John Kuisma; electronics by Robert Cruickshank; prototype booth fabricated in 2010 by Patrick Ellard and modified by Chris Bennett in 2011 (see Woodburned Prototype). See links at top for images and details of booths and cabinets commissioned from 2011 onward. All inquiries, including orders for new cabinets, can be directed to Sarah Peebles [sarahpeebles at gmail dot com]. Photos below by Stephen Humphrey. 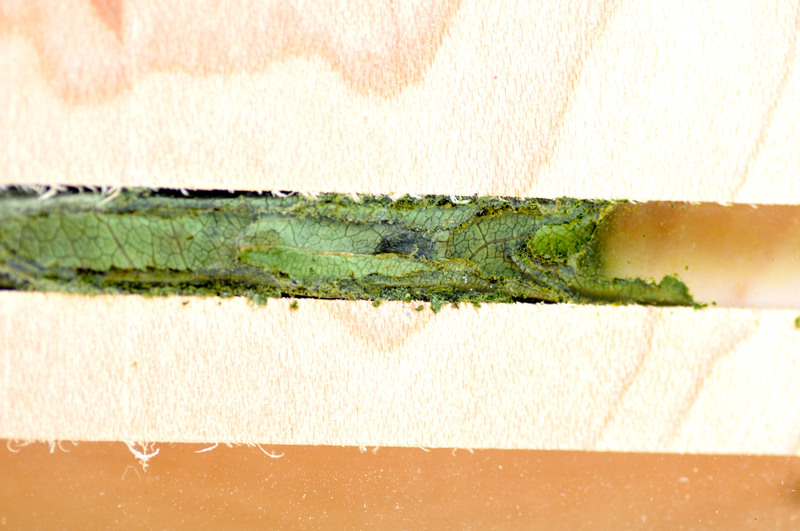 The side of the nesting plank contains leafcutter bee nests made in July by a Megachile relativa (Megachile literally means ‘big jaws’), which saws off oblong leaf pieces with which she constructs her nests. This species of leaf cutter is indigenuos to this region, whereas some leafcutter species originated in Europe or Eurasia (see our Bee Trading Cards #1-4). Another solitary bee – a kind of mason bee, Hoplitis spolias – uses masticated leaves to construct her nest, which she constructed in June. She is one of eight species of Hoplitis, another stem-nesting, summer-flying bee in our area (Eastern Canada); some species range into the sub-arctic regions. Note that this video is silent. 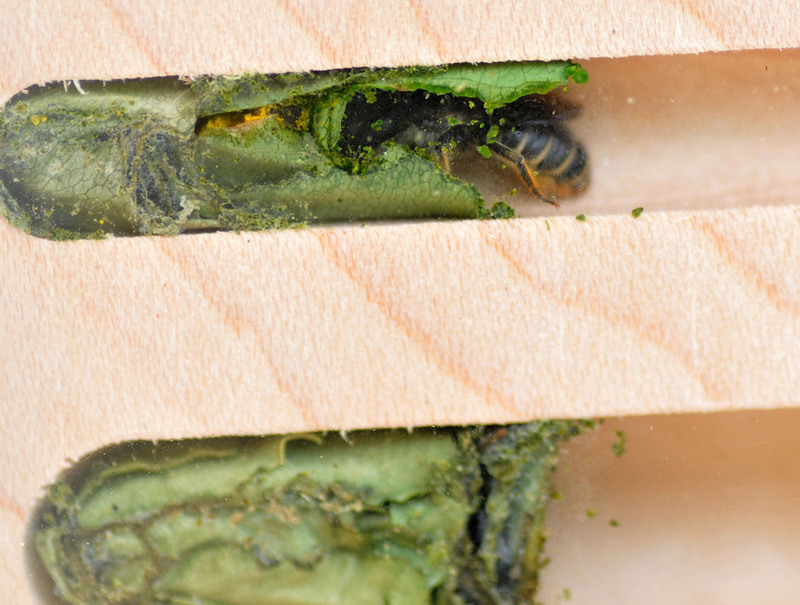 Ground-nesting bees also visit the booth, as do the enemies of bees – cuckoo bees (cleptoparasites). In late-summer male Agapostemon, Toronto’s most glamorous bee, often drop by for a visit. Alex Rempe (top) and Christian Rempe examine mud dauber wasps provisioning their nest cells with stunned spiders, like the ones in these videos. 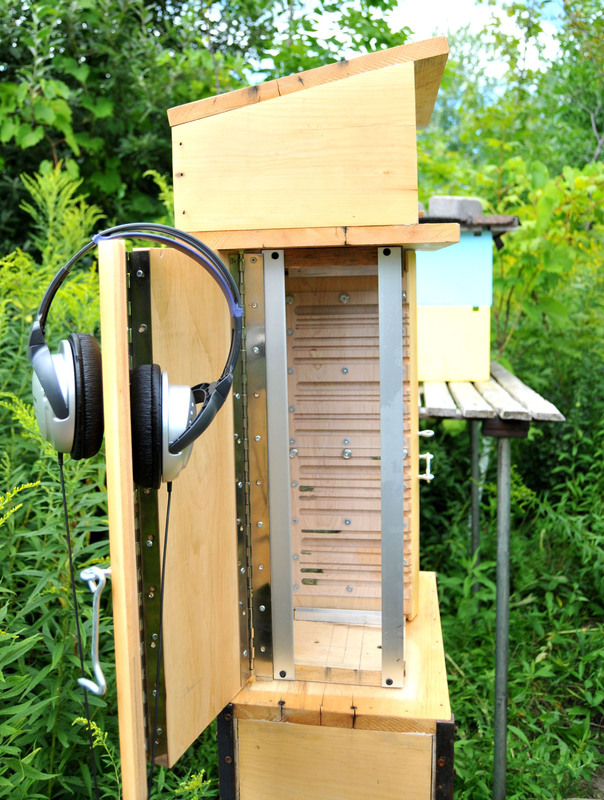 The Audio Bee Booth was inspired by observing Peter Hallett’s bee/wasp ‘condo’, one of which – the blue and yellow boxes pictured above – sits next to our booth (he calls his design a ‘hive’, but not in the traditional sense, as these are solitary insects). Learn more about Hallett’s bee homes on this site at Pink Bee Condo – Up Close and Building Homes for Solitary Bees. No, we’re not! These pollinators do not take an interest in people observing their foraging or nesting activities and will only sting if accidentally stepped on or handled (such as getting trapped in one’s shirt). 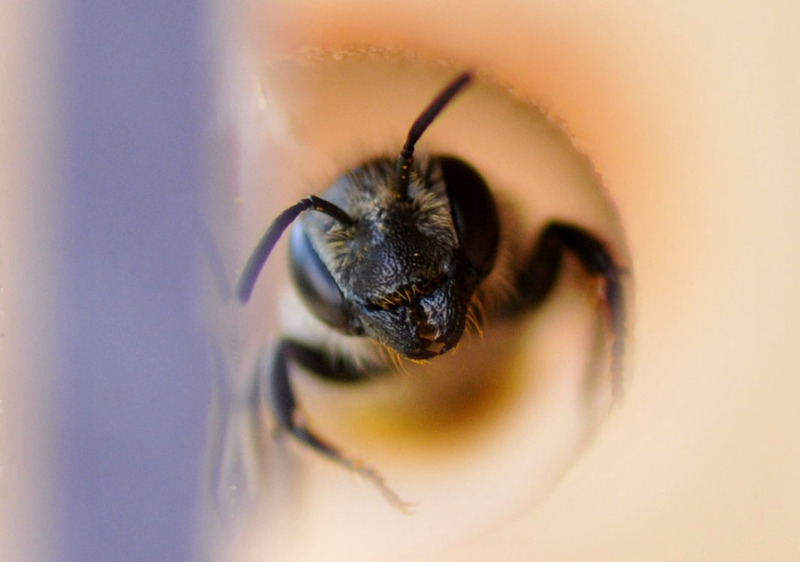 Observing solitary bees or wasps at their nest areas – even up close – does not command their interest in us, beyond being shy (which is common), because these insects have not evolved socially and therefor have no stores of honey or other food to defend from mammals such as raccoons or bears. Thus, they do not feel threatened by human presence at their nesting sites, though they can require patience to observe. The majority of Canada’s 800-pus species of bees are solitary. 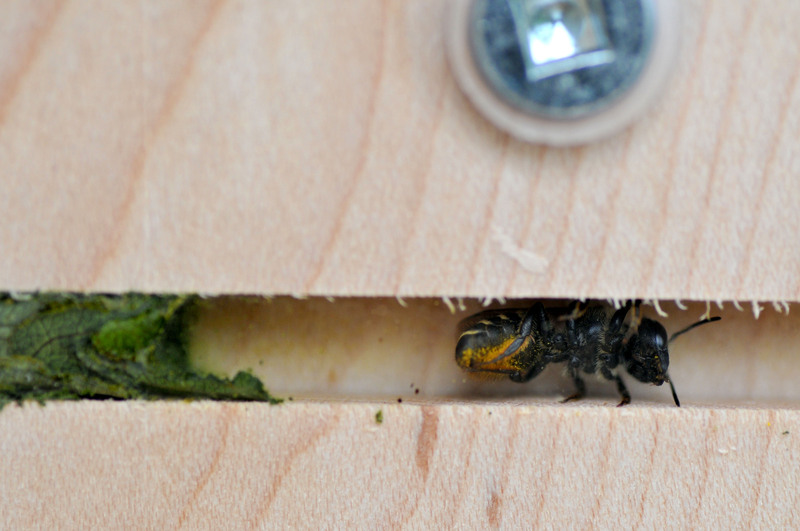 Solitary bee and solitary wasp populations at habitat installations (places created for them, such as bee cabinets, bee houses or bee nesting logs for solitaries) are much the same as populations normally present in the environment, and as such persons with allergies should take the same precautions as in any outdoor situation. All bees in upper North America, including solitary bees, bumble bees (native bees which are social) and honey bees are by nature non-aggressive to people and are not interested in human food of any type, but rather forage for nectar and pollen exclusively. The same is true for solitary wasps, except that they prey upon aphids, grasshoppers and other insects. A note on social bees: Social insects have evolved to defend the stores of food and brood in their colonies which make tasty snacks for mammals. Bumble bees (Bombus) generally live underground in abandoned mouse nests and similar cavities. Although it is unusual to find a bumble bee nest in the wild, caution should be taken if you do come upon a nest entrance, as bumble bees do defend their nests. European honey bees (Apis mellifera) mostly live in managed hives, as they are not native to the Americas, although occasionally feral honey bee hives do survive in the wild in Southern Canada. “Africanized” honey bees (Apis mellifera scutellata), which are a hybrid of European domesticated and African wild honey bee species with aggressive traits, do not live North of the Southern United States and thus are not present in Canada. Read more about Bee Biodiversity (biology and more). 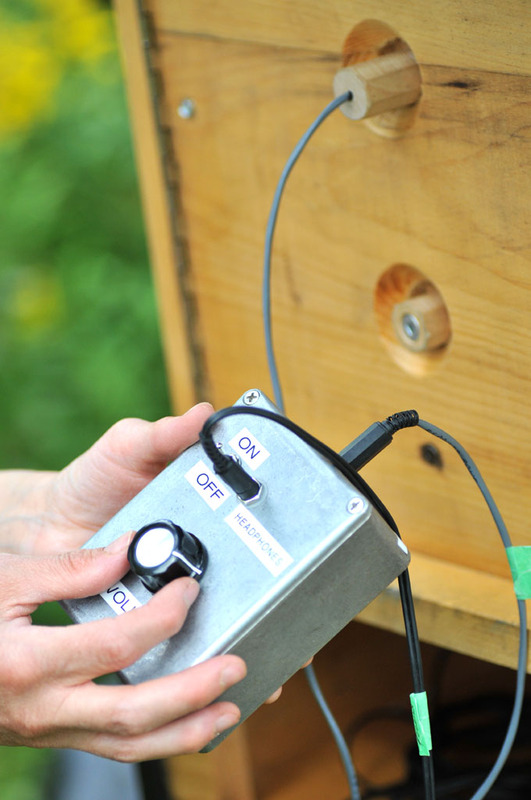 2011 – 2012: Veronica Vladico gathered macro video footage of various bee species’ nest-building activities at two of the audio bee booths in Ontario for research by members of Laurence Packer’s wild bee lab at York University. Additional video footage by Toronto writer and bee enthusiast Stephen Humphrey, taken at his Kamisak Bee Lodge in Beaver Creek, Alberta, may also be reviewed at the lab. Special thanks to the following people for assisting with development of the bee booths, the information sheets, and bee image IDs: Lincoln Best, Stephen Buchmann, Rob Cruickshank, Patrick Ellard, Peter Hallett, Peter Kevan, John Kuisma, Scott MacIver, Laurence Packer, Cory Sheffield, and James Thomson. More Thanks to our demo booth hosts Tom Mason (at the Toronto Zoo) and Clement Kent!